The charity Crimestoppers has launched a national campaign to highlight the devastating effect of urban drug gangs across communities, and is asking for your help to try and tackle the issue by reporting any information on ‘county lines’ anonymously. A new UK campaign is being rolled out in Dyfed Powys, Gwent and South Wales to support Operation Guardian which aims to protect, not punish, the vulnerable adults and children exploited by organised crime groups to move drugs and money to and from the target areas. The charity is running a series of digital adverts aimed at giving you more information on this crime and how you can help by reporting to Crimestoppers anonymously. The campaign will also be promoted at this week’s Royal Welsh Show and through a digital Advan touring parts of Wales. The crime sees gangs often exploiting children and vulnerable adults. They will frequently use intimidation, violence and weapons, including knives, corrosives and firearms. They set up a base in a rural or suburban area for a short time, taking over the home of a vulnerable person and use adults and children to act as drug runners. Many of those targeted have been forced to carry out criminal activity by threats, grooming and extortion and can be described as modern day slaves. In April this year, two gang members involved in county line drug dealing were also jailed for human trafficking offences at Swansea Crown Court. Mahad Yusuf, 21, was sentenced to ten years in prison and Fesal Mahamud, 20, for nine years after they trafficked a vulnerable 19-year-old woman and forced her to transport drugs from London to Swansea. They contacted the victim through social media with the promise of work, but instead beat her and forced her to sell heroin. The case was the first offence of its type to be prosecuted under Modern Slavery legislation. 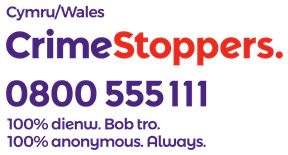 Ella Rabaiotti, Crimestoppers Wales Manager, said: “Whilst drug dealing across our towns and cities isn’t new, the methods employed by organised criminals is becoming increasingly sophisticated and harmful. Vulnerable drug users and young people are being targeted with the promise of gifts and cash but instead are being used and abused to support a network of organised crime. If you have any information on those from cities who have recently travelled or moved into an area to set up a drugs network, those who are exploiting vulnerable children and adults and who may using violence or abuse to carry out their activities, Crimestoppers is here to take your information. You can contact us anonymously on 0800 555 111 or can send an untraceable online form at Crimestoppers-uk.org.